Whether you're studying for a midterm or putting the finishing touches on your big presentation, your work doesn't stop just because the clock says so. 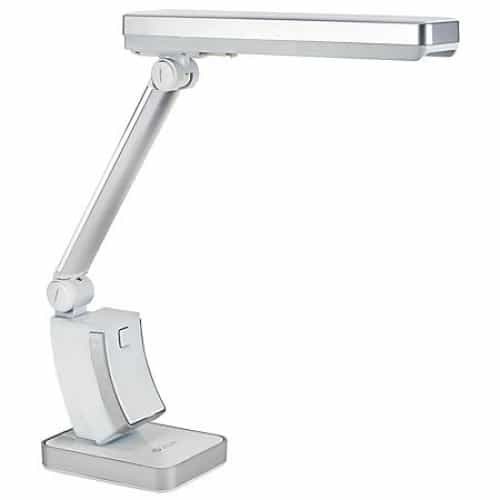 This lamp provides low-glare light, so you can comfortably put in the time you need to get the job done right. Reduces eyestrain to help you read longer and more comfortably. Superior image and color rendering is perfect for your eyes. Precise blend of light wavelengths lets the eye see and focus without the harsh glare. Also eliminates blinding brightness, distortion and fatigue that other light sources can cause. Adjustable arm height and length let you customize your lighting. U-bent fluorescent light bulb included. Light output: 520 lumens. Energy used: 13 watts. Average rated life: 10,000 hours. Durable plastic construction with 72" cord. I'm a first year college student and the lamp in my dorm is so terrible. This lamp was affordable, delivered quickly, and doesn't bother my roommates when I'm up late studying. It gives off enough light so that I can see perfectly without bothering anyone. Super slim and fits nicely on my small desk.